Authors: Sakwa R., Kazarinova D.B. The interview with Richars Sakwa has been held in dramatic days when the New Cold war became an evident reality and the British-Russian crisis provoked the fall of diplomacy between Russia and vast majority of the western countries. The discussion was based on ideas of Richard Sakwa’s recent book «Russia against the Rest. The Post-Cold War Crisis of World Order»: Cold war and Cold peace phenomena and the evolution of post bipolar world. The radicalization of the West puts Russia and the whole world in a very challenging situation when the International society is about to break up and the world orders are almost clashed. radicalization of West, world order, Kantian, Hobbesian, Grotian and Buchanan aspects of contemporary world, four world orders, the clash of world orders, Cold peace, Cold war. - Professor Sakwa, we meet to have a talk in a very dramatic moment for EURussian and especially British-Russian relations. The situation has ‘broken through the bottom’ once again. But the process was pretty long. Your book “Russia against the Rest”  is aimed to describe this via your concept of four world orders. Did I understand right your idea? - I want to set up a framework of analysis to give the big picture. We all wonder how we got into this period of renewed confrontation and conflict, after the high hopes at the end of the Cold War. International politics is not in a good place at the moment. The Cold war has become a reality again. The tense situation between Russia and UK is a symptom of a deeper breakdown in international, and of the failure to establish a mutually satisfactory security order at the end of the Cold War. The international system and the clash of world orders. The Cold War was not only about bipolarity but also about stability - the stability of institutional context and at the same time stability of ideological expectations and diplomatic norms and rules of game. The Cold War represented the institutionalization of Yalta-Potsdam order, which accepted that there are more than one great power. Even in the Cold War period there was an undermining of this order by the Helsinki process, on the one hand, and the socialist alternative in the western countries. There were a lot of challenges to western modernity, and the Russian socialism was just one of them. The intellectual framework of the Cold war was complicated. The main principle became equal sovereignty for all states whether they were big or small. - Where your vision of contemporary world order starts from? Whose shoulders are you standing on? - I would like to say few words about the international system. I use this term based on English school thinking. After twenty years when it was relatively eclipsed English school the Tim Dunne and Christian Reus-Smit “The Globalization of International Society”  appeared. The volume re-examines the development of today’s society of sovereign states, drawing on a wealth of new scholarship to challenge and complement - and above all to develop - the landmark account presented in Bull and Watson’s classic work, “The Expansion of International Society”. The edited book by Dunn and Reus-Smith examined the institutional contours of contemporary international society, with its unique blend of universal sovereignty and global law, and its forms of hierarchy that coexist with commitments to international human rights. - Here in RUDN University we talk for more than two decades about civilizational approach in international relations. It’s a kind of idee-fixe of our faculty’s scholars. Do you use it in your analysis? - The multilateralism of international society in this model is decoupled from liberal hegemony. This entails the restoration of pluralism to the international system, whose normativity is based on pluralism itself. In other words, cultural diversity, different “civilizational” paths and pluralist polity construction repudiate the idea that the historical experience of one set of states can act as universal models to all others. This model also achieves Russia’s long-term goal of an international security system that transcends military blocs. This is a pluralism founded on the belief that each state has to resolve its own challenges, and that historical experience cannot be transplanted from one context to another (the concept of much of post-communist democracy promotion). This does not mean that comparative lessons cannot be learned, but it rejects programmatic attempts to transfer models. This is the conceptual basis for the rejection of norm transfer as an appropriate framework for relations between states. Pluralism is achieved by the recognition of diverse developmental paths to sustain not so much “multiple modernity” (since modernity by definition can only be singular, although taking a multiplicity of forms), as a number of distinctive security and civilizational complexes, each of which taken together is today conventionally described as a project for world order. Neither is this the pluralism generated, as in the realist paradigm, by the return of great power politics. Instead, the various world orders represent a combination of pluralism and solidarism, with the latter represented by the shared commitment to international society. This is a pluralism of procedure (that world orders can relate to international society autonomously, and not necessarily through alignment with the liberal internationalist order), rather than a pluralism based on substantive normative differences. - The contemporary politics makes us to lay aside neoliberal concepts of last few decades and to turn to ‘old-fashioned’ realism and classics of political thought. Which authors should be rediscovered first of all? - This is a substantive invocation of the Grotian position advanced by Bull. He distinguishes between the Hobbesian or realist tradition that sees international relations as a permanent state of conflict between states in a system that is pre-eminently distributive or zero sum. In this perspective, peace is only a “period of recuperation” between renewed bouts of war. Contemporary realist thinkers, such as Hans Morgenthau, have developed a complex language to describe Dominant states try to get others to bandwagon with them, while weaker powers try to establish counter-balancing coalitions. There is little scope for morality here, and instead the Machiavellian impulse prevails. By contrast, the Kantian or universalist tradition asserts that international politics is capable of generating a “potential community of mankind”. Various transnational bonds tie nations and peoples together and foster cooperative policies to transcend conflicts, and indeed ultimately to transcend the state system itself. The moral imperative of what we today call human rights, for example, works not only to limit the sovereignty of states but drives towards their replacement by a cosmopolitan society. In between the realist and universalist traditions there is the Grotian idea of a society of states, or international society. Against the Hobbesians, common rules and institutions constrain the bellicosity of states; but by contrast with the Kantians, states remain the fundamental actors in the international system. In the Grotian concept, states are bound not only by the rules of prudence and expediency, but also by the norms of morality and law as generated by the particular international society of the era. The Grotian approach repudiates the ideological homogeneity so deeply embedded in Kantian cosmopolitanism, while rejecting the normative brutality of realist positions. It has no time for the ‘end of history’ and its concomitant assumption of the ‘end of international politics’; but neither does it succumb to the realist imposition of hegemonic order by powerful states. It offers the possibility of combining political realism and normative pluralism. The privilege of being superpower is that you create the weather. You create your own reality, your fact-based reality. - You talked about ideological Hegelian aspect and normative Kantian aspect of world order but there is a lack of economic agenda, some Friedman aspect. What kind of economics make a global financial and dollar hegemony? Could you incorporate some economic vision? - Certainly, for completion of this model I need the fourth leg - the economic one. But what name should I give to this world - Adam Smith, Milton Freedman or Friedrich Hayek? But even because of radicalization of this liberal market ideas I could use the work of Buchanan [1. P. 11-22]. In other worlds the neoliberalism and anti-statism could emphasize radicalization. That idea became metastased after the cold world. So I’d call it the Hayek world, with a touch of Buchanan’s ‘public choice’ Virginia School thinking. - Discussing your book with Rethinking Russia you said that the main challenge for Russia in 2018 was not “to damage itself”. “Russia against the Rest” can evolve to “Russia against itself” in case of succumbing to western provocations and restricting policies towards the civil society. Did we choose this scenario? How could we avoid it? - When you have the radicalization of the West your natural response is to radicalize yourself. There are plenty of hardliners in the Russian establishment - not only in security services but also in intellectual community as well - who adopt this stance. Two-thirds of Putin’s powerful speech to the Federal Assembly on 1 of March 2018 rejected the mobilization model of economic development. It was a modernization agenda based on the digital economy and public welfare. The pursuing your own agenda is a right way. As for the closure of the British Council as a result of the Skripal affair, it was an over-reactio. In Syria, in Ukraine there are US attempts to provoke Russia to the military conflict at all levels. The very dangerous people do that. As some western media say the grown-ups like McMaster took over from radicals such as Stephen Bannon, but I am not so sure. Are they really the grown-ups? What Russia should do is to have self-confidence to develop its civil society and public sphere. Russia should abolish the foreign agent’s law, which damages the development of Russian civil society and Russia itself. It has to have the independent experts. Most people have responsibility and understand Russian interest. The state should trust the civil society and develop the business climate. That’s a big challenge for Putin’s next period. - Things happen very fast. When you conceived your book, its name was rather provocative, now it absolutely matches the situation. There is no any exaggeration. We just started to think about Cold peace but it has already almost gone to the past. The Cold war 2.0 has come. Even today's discussion can expire tomorrow. How should social sciences deal with this? - As for the Cold peace: my periodization, because periodization is always an explication as well, lasted from 1991 until 2014 when the possibility was still open for the historical West become to Greater West somewhere in the frame of the European Union. After 2014 we have new rule game. Some people call it a new Cold War, I call it the clash of world orders. The title of the book was provocative, it was not just Russia against the West. Russia ultimately has to find and devise the national debate about the world and about itself. Russia is not isolated. Some notions like самобытность, самоопределение should be redefined nationally not only by elites. What should social scientists do with this? The academics definitely have their policy preferences. I am a legalist and evolutionist, not revolutionist and revisionist. I can say that the war stared with the overthrow of legitimate governments. When the Cold war began in February 2014 with proxy conflicts, academics have the duty to be engaged in activity, polemics, debates. The key task is to stop the conflict escalating and explain the logic and the framework in which it is conducted. - The Apocalypses and Remilitarization is a part of your book. This scenario appears evidently and spontaneously. The las part of Presidential message to the Federal Assembly was surprising for the Russian society. Did the Presidential message move the arrow on the nuclear apocalypses clock? There is other position. As we live in the era of nuclear parity and the direct war is impossible, everything can be said, there is no any real responsibility for the words. And the politicians became internet trolls, their statements have no limits because do not really matter. Do they? - We are in more dangerous moment than we were been ever in human history with nuclear weapons, proliferation and the collapse of diplomacy. The nuclear clock is now moved two minutes closer to midnight, closer than ever before. We, social scientist, feel disruption and the lack of mobilization because it’s complicated. We’d mobilize ourselves to find more peaceable options. For example, is president Trump a more peaceable option, compared at least to the alternatives. From the liberal internationalist perspective, Hillary Clinton was a far more dangerous option. She embodied the militant revisionism of the US-led international order and aimed to change the world up to her image. If you don’t want to be changed in someone’s image you will be attacked. Diplomacy has died in the contemporary world, I’m afraid. - The worst thing in today's British-Russian confrontation is a decrease of civil dialogue. You are famous British specialist in Russian studies. Do you feel more interest to yourself by British media? Does British society want to know expert opinion about Russia or it requires post-truth style discourse? - Excellent question! I am afraid it’s the second. Recently on the BBC there was a programme called “Putin, The New Tsar” . I am a great fan of BBC for many years, but I was shocked by complete collapse of intellectual, ethical and moral standards attempt to find the truth. It was a pure Goebbels-like propaganda piece. I couldn’t believe that BBC could show this. There was no any attempt to find a truth, to collect some facts, to debate, there were no academics. So, the answer is no, we are not required. The followers of right-wing positions have now become the mainstream of the intellectual sphere as well as in politics. - EU Russia relations: Is there any chance to improve them and what Russia should do with them? Are there any steps Russia can implement? - The EU-Russian relations are pretty bad. The global strategic position is obviously changed because as the US defects from its own US-led world order, there is an opportunity for the EU to raise its international stature. The European Union itself, its leaders Angela Merkel, Emanuel Macron who restores a neo-Gaullist elements, Jean-Claude Junker, Federica Mogherini were expected to do something. They claimed their voice was not loud as the Atlantists’ one. But there is a potential for things to move in a neo-Gaullist way, but this will require French leadership - something that is uncertain under President Macron. What should Russia do? Andrey Kortunov from Russian Council on International Affairs who is a great analyst and scholar constantly says you have to do some actions, the sort of things to collaborate . But it seems to me unfortunately is only thing Russia can do is saying with words of British defense minister Gavin Williamson is “shut up and go away” . Anything you may do will be taken as a concession. We need to find a new framework in which concessions work both ways. It used to be called diplomacy. Dunne T., Reus-Smit C. The Globalization of International Society. Published to Oxford Scholarship Online: 2017. Available from: http://www.oxfordscholarship.com/view/ 10.1093/acprof:oso/9780198793427.001.0001/acprof-9780198793427 doi: 10.1093/acprof:oso/. 9780198793427.001.0001. Gavin Williamson is “shut up and go away”. Independent. 15.03.2018. Available from: https://www.independent.co.uk/voices/gavin-williamson-shut-up-go-away-russia-vladimir-putinsergei-skripal-a8257466.html. Kortunov A. Hybrid Cooperation: A New Model for Russia-EU Relations. 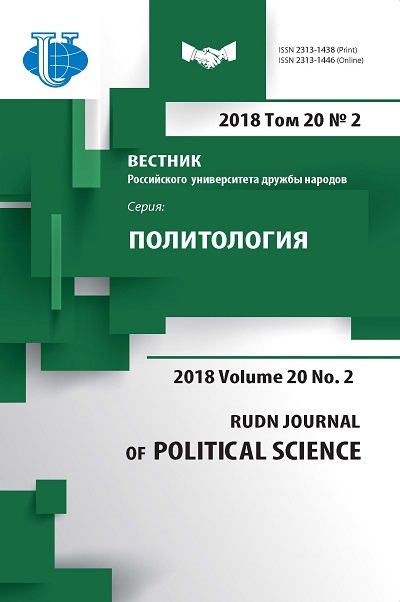 Available from: http://russiancouncil.ru/en/analytics-and-comments/analytics/hybrid-cooperation-a-new-modelfor-russia-eu-relations/. Putin, The New Tsar. BBC. Available from: https://www.bbc.co.uk/programmes/b09vb7m3. Sakwa R. Russia against the Rest. The Post-Cold War Crisis of World Order. Cambridge University Press; 2017. Copyright (c) 2018 Sakwa R., Kazarinova D.B.